Winding my new warp gives me pause—do these colors work? 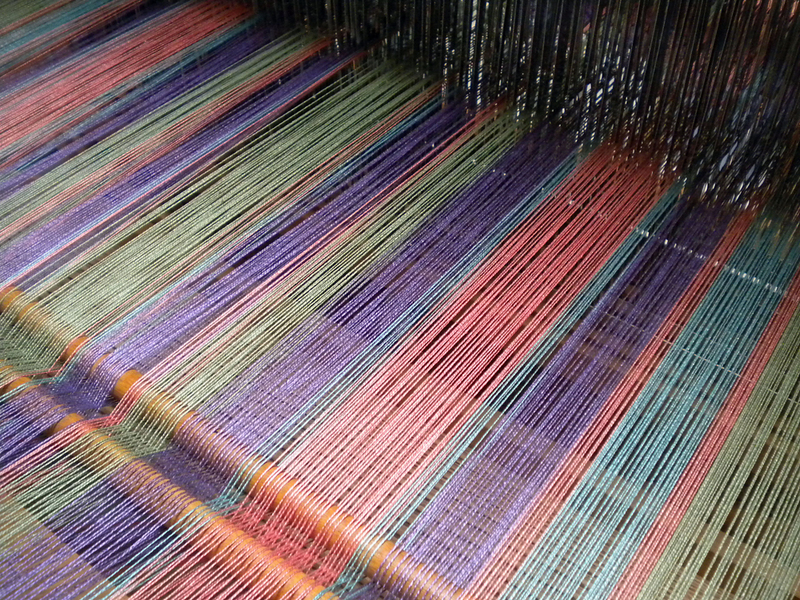 Planning colors can be one of the most difficult parts of the weaving process for me. I’ve designed some real ‘dogs’ in my years at the loom, and other times, the colors just glow. 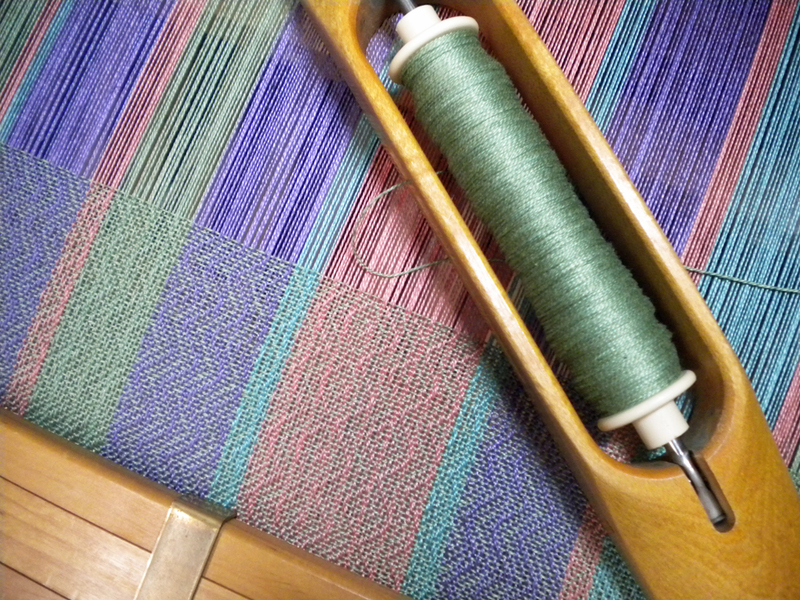 I’m definitely more of a “pattern/structure” weaver and a “color/texture” weaver. Recently I’ve been weaving workshop samples and neutral colors, and really, this week I needed some color. So I went to my shelf and started pulling out cones. Reds, purples, blues, peach, turquoise, green. Which should I choose? Which colors will play nicely together? Sampling would be the wise route to take, but I’m very impatient to get this one the loom. That may come back to haunt me. I remember hearing Sharon Alderman talk about color—look at what Mother Nature puts together and use that as a starting point. Okay. I can see some of these colors in my flower garden, but not all of them on the same stem. After some sorting, I settle on UKI’s Quince (a dark peach), Duck (close to turquoise), Lavender, and Scarab (a soft sage green) for towels. (Color names are interesting—can you just imagine someone saying “We’ve already got a green. What should we call this shade?”) As I wind the warp, I have second thoughts, but it’s too late now. Such indecision! I sley the reed. Hmm…I hope this works. Okay, today I wound the warp onto the back beam and tied the warp to the breast beam—all 642 threads, each 7 yards, 21 inches. The colors of the mercerized cotton glow. A few inches woven show that hey, this might work after all. With house guests for the next week and a family wedding to follow, the warp will wait for confirmation. And I will still need to decide on weft colors, but every time I walk by the loom, I’ll think about these colors and dream about some nice colorful towels. 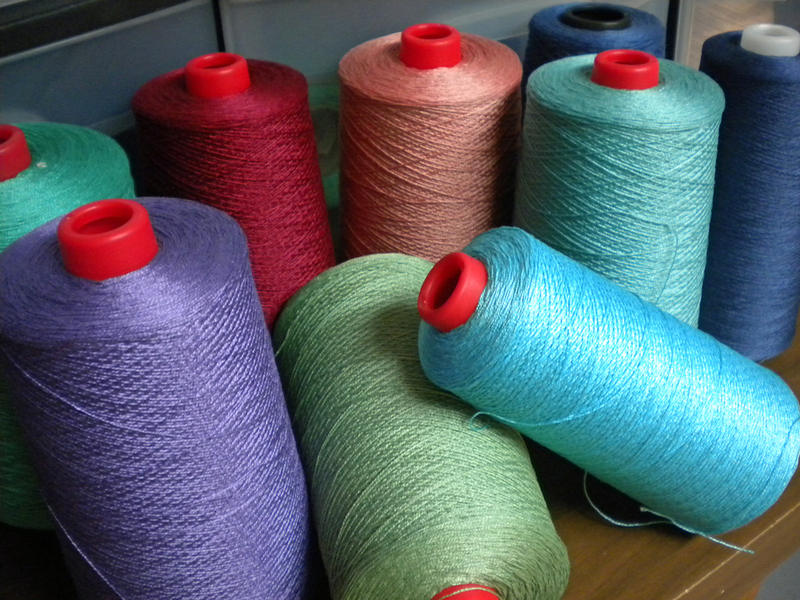 How do you choose the colors for your next project? Jean, your color choices are just lovely. The soft colors remind me a a Monet painting. So good to hear from you, Martha! And thanks for the affirmation. Monet painted such lovely scenes–I’ll visualize his garden scenes as I weave! I’ve been thinking lately about how much more competent I feel with structure than color! Color seems to stump me every time–does it get easier, with more experience?